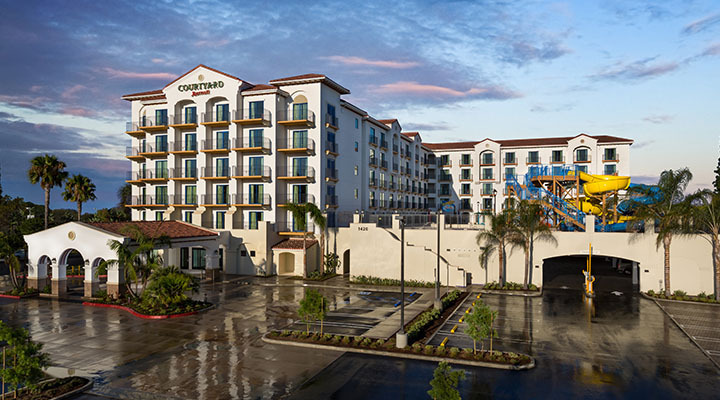 Stay at the Courtyard Anaheim Theme Park Entrance for the ultimate family friendly vacation experience. 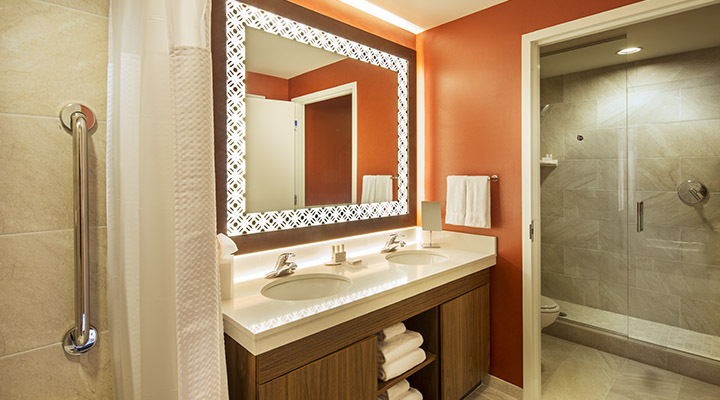 Minutes away from the DISNEYLAND® Resort, you are just a short walk away from all the magic. But the fun doesn’t end at the parks! Cool off at their exclusive Surfside Waterpark complete with huge waterslides, drench bucket, swimming pools and more right on property. 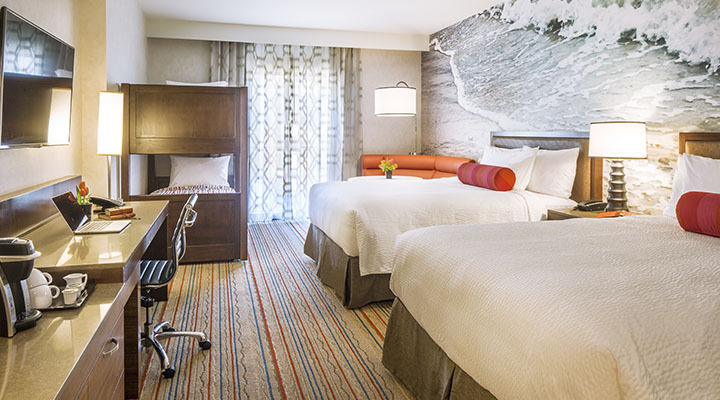 Enjoy the space of huge rooms with bunkbeds, plus free Wi-Fi and Netflix capability in every room. VALET PARKING ONLY. Valet Parking only - $20 per night. Cool off at our Surfside Waterpark, which features 30-foot water slides, a 400-gallon drench bucket, swimming pool, kid's pool, and mesmerizing views of the Disneyland® fireworks display. We loved everything about this hotel! It was very clean, well maintained, and the staff were always helpful and friendly. Our kids loved the bunk beds, and we loved the spacious bathroom that has a double sink and two showers. We enjoyed the outdoor pool/water park. It was chilly weather during our stay, but because the pool is heated and there is a large hot tub, we still enjoyed swimming there a few times. It was also nice to be within walking distance to the parks. We got a "suite" which was barely larger than a regular room. The hotel itself is nice and fairly close for walking although I was led to believe it was closer. Staff was nice. I almost don't want to tell people how great this hotel is b/c I don't want it to get booked up if we go back! The staff was so friendly and helpful. The rooms were clean and I loved the fact that we had 2 showers in the bathroom which made getting ready & cleaning up SO helpful with kids. My kids loved the bunk beds. The small dinette in the room was great since we ate breakfast and dinner at the hotel. I also had groceries delivered to our room and the hotel staff was great about making sure our food got delivered to us. The hotel is a 5 minute walk to the Parks and there are plenty of restaurants along the way to the parks. We would definitely stay here again and I highly recommend it. We love this hotel. This was our second stay here. Everyone is so friendly and helpful. The waterpark is a lot of fun and our view from our room was fantastic. They have excellent customer service all they way around from the bellhop to management. The rooms are very nice and spacious, kids loved the bunk beds and it is nice have the extra space. the location is even better you are so close to Disneyland/California Adventure, the walk there is a breeze. There is a McDonald's and Panera outside the hotel entrance which is very convenient. if you are looking for a place to stay this is it. We were greeted by every staff member we came in contact with. They were helpful with every question we had. Beds were comfy! The kids loved the waterpark! One of our kids ended up in the hospital during our stay and they were very concerned and helpful, even calling our room to make sure we were okay because my husband was at the hospital while I stayed at the hotel with the other kids. We will definitely stay here next time we visit. We are so impressed with this hotel. The customer service was amazing; everyone was so friendly. The rooms are spacious, with bunk beds and two showers. There is a Starbucks in the lobby, and a gift shop with reasonably priced Disney items. The valet was so accommodating when we needed to get our daughter's jacket out of the car. This is our new favorite place for Disney vacations. We were so excited to find our room was really clean upon check in. The location is great, the rooms are large, there is a lot of storage, and microwave/small refrigerator in the room. We were so excited to drive up and see the hotel was decorated so cute for Halloween inside and out it really got my 5 year old even more excited and my 8 month old loved seeing all of the decor as well! We didn't get to enjoy the pool area much because of the fire in Anaheim hills but it was really nice for the short time we spent out there! This is our new go to hotel for sure! This was a perfect hotel for my family. The rooms are great and the waterpark was lots of fun. The staff was so friendly, the entire grounds clean, pool the right temperature and hot tub was hot! the beds were so comfortable and relaxing! The Bistro made great Latte's and The store was well stocked with souvenirs and snacks. The Bistro was not open all day but we were too busy to eat there. We would definitely stay here again. We were so tired after a long day that the11 minute slow walk back was not too bad for a close hotel with perfect Amenities! We would get back to the hotel and watch the fireworks from the pool or Back deck! We loved this hotel! They are very accommodating and let us swim after we checked out and waited for out flight! We loved staying here. The staff was so friendly. The bistro staff was by far my favorite. The patio was a great place to relax, and check out the fireworks. The rooms, AMAZING! There was plenty of room for my family of 5. The beds were so comfortable, and the room was so quite, we slept in every moring. We have talked about it, and will definitely make thus or go to hotel. We could not have been more pleased with the hotel, its amenities and its staff. The room is great for families with the large space, two queen beds, bunk beds and two showers. The location to Disneyland was great with just a short walk. The staff was great including the General Manager. We normally stay at the Grand Disneyland hotel, however we felt that the hotel room was actually better than the Grand for a much better price. And actually the walking distance is about the same to Disneyland. 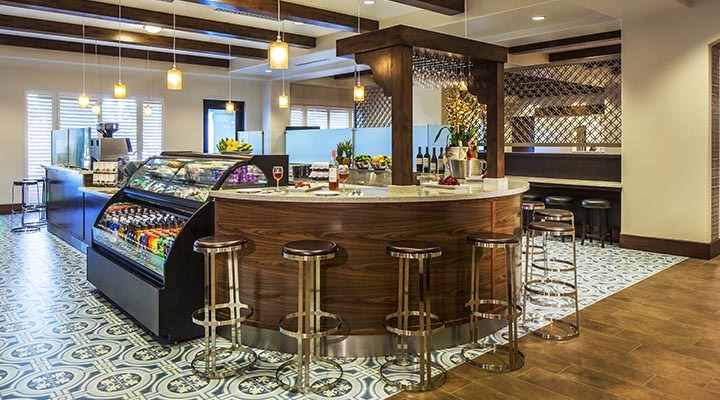 We would highly recommend this hotel to anyone visiting Disneyland with their families. The only downside was the parking fees and no complimentary breakfast. But we do realize a lot of the other hotels around Disneyland do charge for parking and others do not offer breakfast.